Let's engage students in cognitive apprenticeships, help them practice the tenets of good citizenship, and encourage them to construct their own understanding of the world. This past year, iPads, Chromebooks, and laptops continued to flood classrooms. Schools increasingly adopted 1:1 or BYOD programs and constructed new learning spaces. So what's next? Now that students have increased access to digital tools and devices, I think that 2016 may be the year of student agency -- the ability to act independently within a given environment and assume an amount of control and empowerment. In other words, this may be the year to truly empower students to become active learners. In their book Tinkering Towards Utopia, David Tyack and Larry Cuban describe education reform as both incremental and cyclical. Over time, schools make incremental changes. Meanwhile, specific conversations repeat themselves in cycles. However, as a topic reemerges, the environment has shifted. Agency and learner empowerment are not new concepts, nor are the recommendations for how to achieve them. However, the landscape no longer looks the same. Since the Middle Ages, individuals looking to become masters of particular subjects engaged in apprenticeships. In this role, they not only gained procedural knowledge, but also became enculturated into the community of practice. John Seely-Brown, Allan Collins, and Paul Duguid suggested applying this concept to the classroom through cognitive apprenticeships in the 1980s. They argued that school removed context from learning, as classroom culture does not mirror real-world culture. Students may gain book knowledge but have no idea how to apply it as a practitioner. Science teachers employ labs to provide students with an opportunity to engage in the practice of science. Through pre-labs, teachers model skills and procedures. Students learn through observation, much like a young apprentice. During the lab phase, they assume the role of a scientist, but in a scaffolded setting. Great science teachers help their students develop the language and culture of scientists as they engage in inquiry, formulate hypotheses, and test solutions. However, this model of scaffolding and enculturation could be scaled across the curriculum. Consider a history class like that of Taylor Bingle. He asks his students to "do history." As cognitive apprentices, they experience the authentic tools, language, and culture of true historians. Students collaboratively analyze primary source documents and record their thinking with screencasts. They debate concepts and construct their own understanding rather than digest and repeat content. Through scaffolding, modeling, and eventually relinquishing control of the conversation, Taylor empowers his students to actually become historians rather than just study history. In the 1930s, John Dewey argued that schools should provide opportunities for students to engage in democracy and practice the tenets of good citizenship. Through student-centered learning, differentiated instruction, and connecting the classroom to the world, Dewey proposed that students should assume an active role in their learning process so as to develop the skills for becoming successful members of their communities. Project-based learning provides one strategy for achieving this goal. Students identify a problem, engage in inquiry, and present a solution to a broader audience. This can happen at all grade levels while still meeting specified learning standards, as proven by Billy Corcoran's fourth-grade class. Last spring, his students tackled the question: "How can we help the Old Orchard Beach (Maine) Conservation Commission educate our community about biodiversity and conservation in the new Milliken Mills trail area?" By partnering with local experts and collaborating with the community, his students engaged in inquiry, developed projects, and gained content knowledge that extended well beyond the classroom. Billy's students chose how they wanted to represent their learning and contributed to their community in a meaningful way. Since I wrote about transforming learning spaces into makerspaces, a number of educators have shared their stories. However, few match the thoughtfulness of Todd Burleson's IDEA Lab. 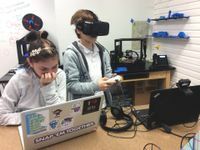 While numerous classrooms have invested in 3D printers, robotics, and fablab materials, the curriculum rather than the technology is what makes Todd's space unique. His ultimate goal is providing students with the opportunity and space to engage in active, meaningful learning. When we speak of the civic functions of education then, we envision a culture of reason, analysis, and reflection, based on certain shared knowledge. Realizing this vision will require a civic consciousness that goes beyond the individualist one of current classroom learning models, and draws on models of shared intellectual functioning such as we see in our best work environments. What's next in 2016 may already be here. Given the tools available, we have more opportunities to engage students in cognitive apprenticeships, provide them with opportunities to practice the tenets of good citizenship, and encourage them to construct their own understanding of the world. This may be the year of agency as we empower our students to assume an active role in their learning and play a critical part in the construction of their environment.